These sweet little birds look so pretty hanging over my kitchen window. The quality is great and plan to by others. 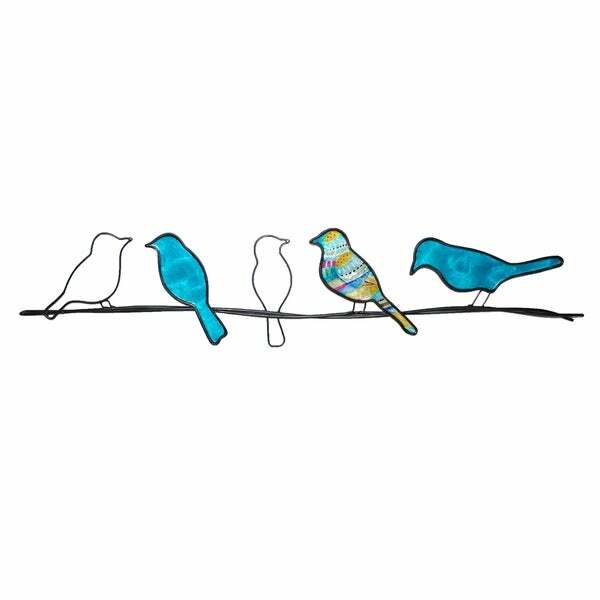 An old parable states that five birds were resting on a wire. Two decided to fly south. How many were birds are left? One's initial answer may be three, however, the answer is still five. The moral of the fable is actions are more important than intentions. A kind reminder that a truer picture of one's character is drawn by actions. This carefully crafted, handmade, artisan piece uses a basic from of wrought iron, powder coated for a durable finish. The inner portions are then left as a silhouette or are hand-painted and sealed giving the piece a classic yet clean finish and allowing the piece to be outdoor safe. Dimensions 28.5 In. X 1.0 In. X 6.0 In. I love birds objects to decor my home. 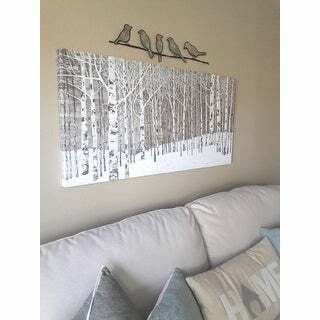 I purchased this for my living room wall above the birch tree wall art. I love the color and design. And good quality too. 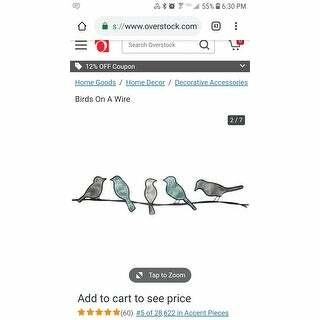 I will recommend this to anyone who loves birds decorations. You will love it! Quality craftsmanship. This wall hanging is perfect in my home. It adds a very personal touch to my home. I would recommend it to others. The price was great as well. This came from Lawrence Ks. We live in Overland Perk Ks. I like that this company has an open concept and provides opportunities . I didn't realize that until I read the card that came in the package. There was photo of employee doing their work. I know it is for a wall but I hung it in the arched window that is above the rectangle window in the bedroom. I thought it would show the colors on both sides. It is black metal on the Backside which is the mold to secure for the colored substance . Makes sense when I saw it as it is deigned to hang wall. From outside it is fine that the design is all black. I like knowing that this item was handcrafted and provides a good working environment. I might see if I can find this operation next time I am in Lawrence Ks home of the University of Kansas Jayhawks. I have a connection now to the piece of artwork in my home. This is so precious. I hung it above my big screen. I really like the gold tones. I expected it be more blue like the picture but it has kind of a gem quality finish and the colors are more earthy. It has the the double hook hanging and I perfer single, that was disappointing but still 5 star quality. Nice piece. Perfect choice. Beautiful colors. I did paint the two metal outlines only in black to be better seen against the wall as the others are. This is perfect for any room. I had planned one place for it, but I found three where it's just so pretty, so I haven't hung it permanently yet. I know you will love the pretty colors. 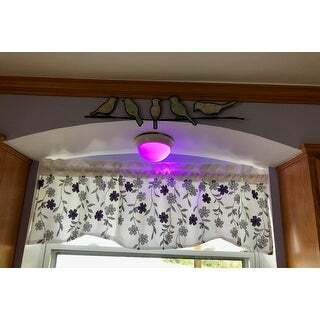 These are beautiful, hand crafted and simple and love the way they complement the gray and purple we painted in the kitchen. I ordered two other items from the same company, in purple, and these work so well with those. We're tackling updates and painting, room by room, and am finding great buys and unique items at Overstock. Love it and I'll be back! This is so pretty. The colors pick up some of the colors around them so I think you could use this anywhere. 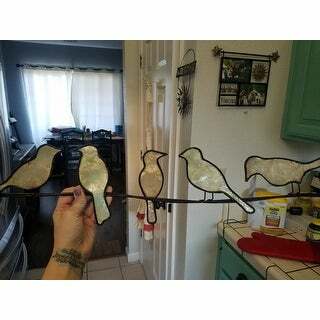 One note, the birds are not transparent, there is a thin metal back, appear to be maybe capiz? But they do have a stained glass look to them. I would definitely recommend. This piece is nicely made, however it is not green, not even close. I may return it. Absolutely beautiful. Hand crafted so every peice is unique! A card comes with it to meet the artist. One of a kind is preferable. I would reccomend this to any bird lover! The color is not the same as pictured at all. Pretty disappointed as I got this to go with the colors in my kitchen. Love the birds on a wire. Just know the color of the birds are not blue. I was so pleased when I unwrapped the package. It is colorful, well made, sturdy and just perfect for over the door décor. Love it!!! Great colors and catches the sun perfectly!! Just beautiful and nice craftsmanship! This birds on a wire is not really too colorful, but hanging from a fish line in my window the silhouette is very nice. Adds a bit of nature to my room. Well made and not flimsy or too breakable. Sorry, but I thought the quality was poor. Stained glass looked cheap and the glass birds were not completely filled in. I returned this product. Will say that Overstock handled my return request promptly. This purchase was much better than I had hoped. For the price, this is a very attractive wall hanging. I bought it in the blue and it looks very vibrant! Really beautiful. We got the gray/green colors. Excellent quality and really unique - it looks perfect above a door frame. We also bought the butterflies by the same artist and we may get a few more. "Are these available in the Red color? I only see the brown showing up as an option to purchase." It was unique, simple and pretty! "what size is this piece? hard to decide if it's a match when size of the piece is not disclosed." Dimensions	28.5 In. X 1.0 In. X 6.0 In.